Necromancers: dark, depressing, drearily-dressed, and contact with said frequently leads to defenestration. Can I stop alliterating now? So, find one as our protagonist? It's original - and it works. Johannes Cabal is a necromancer, his blend of cold blooded (or as he's politely labelled by an employer, sang froid) pragmatism, love for the scientific method, and a certain measure of magic - or sufficiently advanced technology - having kept him in business. Ie. away from the nearest stake. From the moment I read the foreword (warning of dire insanity and pointless crabs), to the (much later) minute I closed the novel, I was completely engaged. Cabal's unique viewpoint is hilarious, especially once he enters the Dreamland - the epitome of irrationality and something he does, of course, get to complain about. A lot. Just watching Cabal attempt to apply the scientific method in a world where not even space and time are continuous, and up is frequently down depending on who's dreaming it - well, it never fails to amuse. It's not all fun and games, of course - even in comic fantasy. The cover claims The Fear Institute as both 'dark' and 'gripping': both of which it surely lives up to. Cabal has been getting development over books one and two, and it's starting to show - and the expedition for the Phobic Animus certainly isn't all it seems. There's a mystery in play, and with Cabal attempting to get to the bottom of it... It makes for an interesting ending. While the novel slows down slightly near the end, the ending itself took me entirely by surprise - and in hindsight, really works. It's reminiscent of Sanderson's endings: the clues are there, but how they tie together will defy expectation. There's a hook for the sequel to die (and in this series, be messily resurrected) for. This is comic fantasy written by one of the wittiest genre voices of recent years - and within its scope, I can't fault it. Have you read this book, or plan to? Comment and tell me below! I haven't read any of the short stories, actually - where did you find them? Though the shorter follow-on in the end of 'Johannes Cabal the Detective' was a fun addition. Hope you enjoy the remainder of the novel, because I certainly did! The ending completely subverts your expectations. Or at least, it did mine. After reading the first two novels and Howard's short in the House of Gears, I feel a little dead inside. No pun intended. Here I have read the greatest narration of my life and now I feel as though no other book written (or to-be-written) will ever fill the void. Johannes is one of the most amazing characters I have ever had the pleasure of stumbling across in my life, and I can only hope that Howard has as many stories planned for Johannes Cabal as Jim Butcher has for Harry Dresden, because there is just something about this work of his that has me wholeheartedly (and willingly) enthralled. I look forward to reading "Johannes Cabal and the Fear Institute" and only hope that I am not too disappointed with anything written by anyone else between now and then. 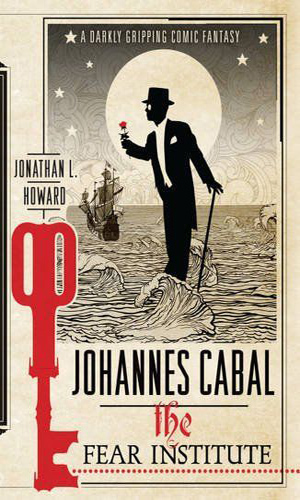 Totally true - I love the character of Johannes cabal, and you're right: there is nobody else quite like him. (Perhaps, however, in a good way - I don't think I'd appreciate it as much if it wasn't so original). I've heard there's more planned, and I'm very much looking forward to it (as you should to the Fear Institute - because it's genuinely fantastic, and really highlights the connections in the series). I have read the fear institute after being hooked on the series from the very first book !!! I read the first two books in 2011 in about 7 days. then waited an agonising 9 months for the third one to be released in the US. the ending is brilliant though I agree with Jacob that the story slows down quite a bit towards the end. The end is a very nice and sharp twist. But to be completely honest I found the third book less humourous than the first two. Though I am eagerly waiting for the fourth one I had expected something more... well like Johannes Cabal rather than H.P.Lovecraft in the third book. Oh well.. let us see where the 4th one leads us..
Too dreary- genre for me.